Nigel Barker plays a photographer on TV. He is also a photographer in real life. Complications ensue. "I often get, 'Oh, do you do your own photography, or are you just on that show?'" Barker says. "And I say, 'Well, I'm a photographer on that show, so yes, I do.'" Nigel Barker's Garden of Eden, ""'shot for America's Next to look "fierce" while dishing out what some people call tough love and others call sadistic humiliation. Reality television has seldom been as floridly dramatic as ANTM. "You can't stop watching it," says one young woman I know who admits she is hooked. "Hie show is like emotional crack." Amid the tears and backstabbing, Barker lends ANTM what every reality-TV show needs: a dose of reality. Says Banks, "Nigel is fantastic on America's Next Top Model because he is able to draw on his experiences as a fashion photographer to be both informative and entertaining. It doesn't hurt that he is breathtakingly gorgeous. Our audience has a huge crush on him." T~ hen Barker photographs the girls on % % / ANTM, you see a professional at work. T ▼ from shoots that either Tyra or I have actually been through, if reincarnated in a slightly more dramatic manner," he says. The contestants on the show may never have real careers—that, indeed, is one of the criticisms directed at ANTM by fashion pros— but Barker does. The problem for Barker is the way reality television transforms reality into something that doesn't feel quite real—what Stephen Colbert calls "truthiness," as opposed to simply the truth. On the other hand, television has given Barker something of value. It has made him the best-known photographer on the planet. Barker himself does not make that claim. I heard it from another photographer, Russell James, who told me last year that he heard it from someone at International Creative Management, the Hollywood talent agency. At the time, ICM was developing a reality-television show called The Shot, in which a group of young fashion photographers would compete for fame and magazine assignments. Barker, already established on TV, was producing, and lames was to be the on-air talent. THE PROBLEM FOR BARKER IS THE WAY THAT REALITY TV TRANSFORMS THE REALITY OF HIS CAREER INTO SOMETHING THAT SOMEHOW DOESN'T PEEL OUITE REAL. 1. Barker photographed model Chris Wheelen with an imposing white python for ReFresh magazine. 2. Tyra Banks, the fierce host of America's Next Top Model, with contestant Yoanna House. Barker shot the pair after House was named winner of ANTM Season Two. 3. A Barker shot of model Tori Praver. 4. In February Barker traveled to Canada on behalf of the Humane Society of the United States to document the "harvesting" of baby seals for their white fur. He took along assistants and enough lighting gear to produce beauty shots. 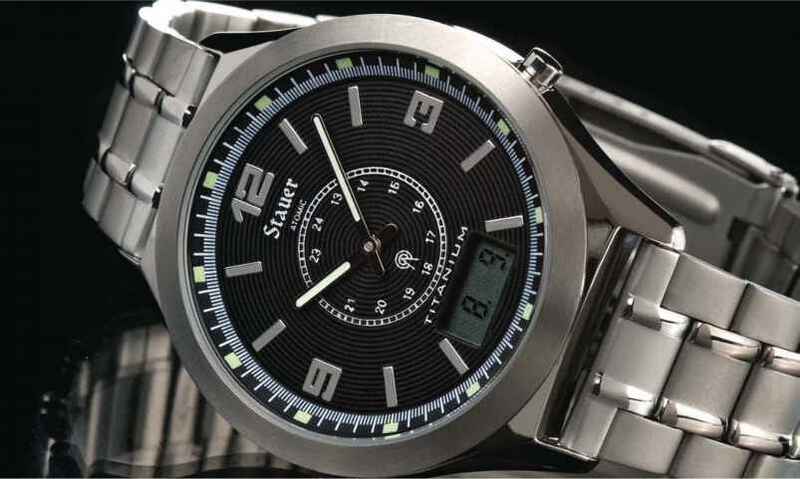 £he Stauer Firnes it's About Time"
Super Light Titanium Timepiece Loses Only One Second Every 20 Million Years. BOULDER. Colorado The U.S. government has engineered the most ingenious, most accurate clock in the world: the F-l U.S. Atomic Clock in Boulder, Colorado. Our extraordinary new Stauer Titanium Atomic Watch utilizes the transmissions directly from that remarkable cesium fission atomic-clock to report the most precise time. This scientifically advanced timepiece will gain or lose only one second over a 20 million-venr period. It is that accurate! This perfectly tuned technological invention with the super light strength of titanium is now available for UNDER S2(K). Super Light Titanium has two big advantages over steel. One is corrosion resistance and the other is that titanium has the highest strength-to-weight ratio of any metal, which means that titanium is approximately 45% lighter than steel. But every other titanium watch that we can find is priced at over $400, and none of those are nearly as accurate as our atomic movement. Stauer has decided to bring these resources together in a timepiece that has the most accurate movement available today.You'll never have to set this watch. Just push one of the buttons and you are synchronized with the atomic clock in Colorado, and the hands of the watch move to the exact time position. The sleek black textured dial has luminous hands and markers plus the timepiece is water resistant to 3 ATM. A Titanium-clad offer. This Titanium Atomic-Watch exceeds the accuracy of any Swiss luxury automatic so you can be more punctual and keep most of your money in your wallet, not on your wrist. Look at your watch and we guarantee that the time is incorrect, unless you arc wearing the advanced atomic technology. 'Hie Stauer Titanium Atomic Watch is not available in stores and it comes with our 30 day money-back guarantee. If you're not completely satisfied with the accuracy, simply return the watch for the full purchase price. Call Toil-Free now to take advantage of this limited offer. What the garden of eden looked like?